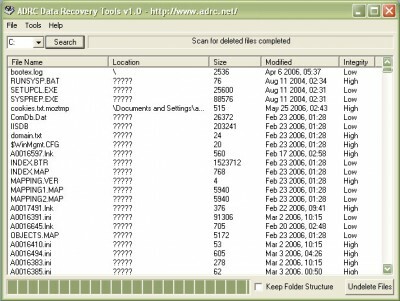 ADRC Data Recovery Tools 1.0 free download. ADRC Data Recovery Tools includes a collection of DIY data recovery tools that supports a wide variety of drives and file systems (NTFS of FAT) for Windows. ADRC Data Recovery Tools includes a collection of DIY data recovery tools that supports a wide variety of drives and file systems (NTFS of FAT) for Windows. R-Linux is a data recovery and undelete utility for Ext2FS (Linux) file system. SoftPerfect File Recovery is a useful application that helps you restore accidentally deleted files from hard and floppy disks, USB flash drives, CF and SD cards and other storage media. Remote Recover is an advanced Windows NT dead-system recovery utility for Windows NT/2000/XP installations. Raw Copy copys a disk as a raw image from one drive directly to another. XXCLONE duplicates the whole Win NT, 2 or XP system volume to another volume that will become ready to boot without a restore step. NTFS Reader for DOS is a freeware tool that provides read access to NTFS partitions within the MS-DOS environment. DriveImage XML is an easy to use and reliable application for imaging and backing up partitions and logical drives.